Pristine glistening white sand beaches, spectacular sunsets every evening, no traffic lights, no high rises and a relaxed lifestyle. Mexico Beach has always been known for its beaches, sunsets, calm water and world class fishing. All properties in Mexico Beach are within walking distance to the beach OR a short golf cart ride to the beach. Life is good along the coast at Mexico Beach Florida. Each side has 2BR/1B with large porch. Living-Dining-Kitchen Area with views of the Beach. Living-Dining-Kitchen with views to the beach! Awesome views of the beach only 2 lots away. Mexico Beach has added sidewalks during the past year. the restaurants and shops along the way. A great addition to Mexico Beach! which should be complete by May 2010. Sacred Heart Hospital in Port St Joe Florida is opening soon. Open House is scheduled for March 6th. Mexico Beach Florida and The Forgotten Coast of Florida are growing in a good way, so don't miss out on an opportunity to own a piece of this paradise. NOW IS THE TIME TO BUY! 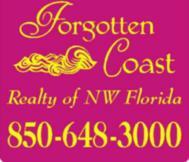 CALL ME TODAY 850.819.1205 AND GET STARTED ON YOUR PROPERTY SEARCH!